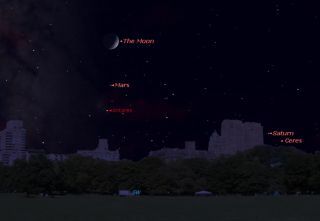 This sky map shows the position of Mars and the moon, as well as the bright star Antares, and planet Saturn, as they will appear in the southwestern night sky on Sept. 29 at 8 p.m. local time for observers in mid-northern latitudes. Skywatchers have a chance to see the moon sweep past a fading Mars tonight (Sept. 29). After the sun goes down this evening, look about 15 degrees up from the southwest horizon. (The width of your clenched fist held at arm’s length measures about 10 degrees.) There you’ll see a crescent moon, 30 percent illuminated. Hovering almost directly below it will be a moderately bright yellow-orange "star." Currently Mars is 142 million miles (228 million kilometers) away and shines at magnitude 0.8. On the list of the 21 brightest stars, Mars would currently rank 13th — quite a comedown from early April, when the planet was more luminous than Sirius, the brightest star in the sky. In terms of apparent size, the disk of Mars is downright tiny; only a large amateur telescope is likely to show any dusky markings on it. The gap separating the moon from Mars tonight will be about 6 degrees, which is slightly greater than the distance that separates the Pointer Stars (Dubhe and Merak) at the end of the bowl of the Big Dipper, which point the way to Polaris, the North Star. In the time it takes Earth to go around the sun 79 times, Mars orbits almost exactly 42 times. Thus, in each Earth year, Mars travels 42/79 of its orbit, or a little more than half. If Mars completed exactly half of its orbit every Earth year, we would pass Mars — that is, there would be an "opposition" — every second year, at the same month and place. As it is, the oppositions fall at 2 years plus about 50 days. So right now, Mars is repeating its behavior of 79 years ago, in 1935. But what is always different is the pattern of its conjunctions with the moving array of other planets. Mars is usually involved in many more conjunctions than are the more distant planets, because its long course around our sky carries Mars in front of them. Mars is currently positioned against the distinctively bright stars of the constellation Scorpius, the Scorpion. In fact, the Red Planet is hovering only about 3 degrees directly above its so-called "rival," the ruddy star Antares, which marks the heart of the scorpion. And indeed, back in late September 1935, Mars had a very similar conjunction with Antares. Editor's note: If you capture an amazing image of the night sky and would like to share it for a possible photo story or gallery, send images and comments in to: spacephotos@space.com.